Port Manatee offers a host of security training courses and is the country’s only seaport certified by the U.S. Maritime Administration to teach Facility Security Officer (FSO) training. 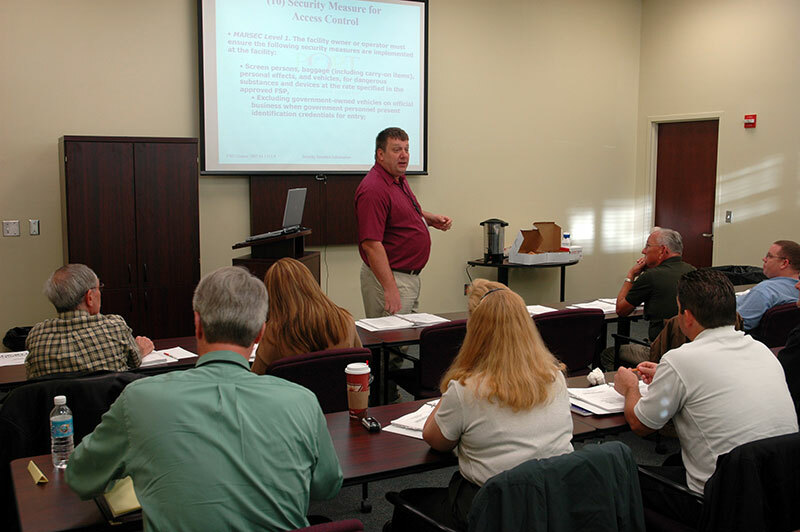 Additionally facilities security training courses that comply with all International Ship and Port Facility Security (ISPS) Code and Maritime Transportation Security Act of 2002 (MTSA) are available at Port Manatee. These modular courses were developed to meet the training requirements outlined in 33 CFR 205, 210 and 215. Courses are offered at Port Manatee, Palmetto, Fla. on the following dates. The FSO Certification course has been approved by the U.S. Maritime Administration and fully meets the training requirements outlined in the International Ship and Port Facility Security (ISPS) Code section B 18.1 and the implementation regulations of the Maritime Transportation Security Act (MTSA) Title 33 Code of Federal Regulations Part 105 — fully complying with U.S. Coast Guard training requirements. This 16 hour program is intended for law enforcement personnel who perform Port Security duties and was developed to meet the training standards published by the U.S. Maritime Administration, meets the requirements of 33 CRF 105.210 and ISPS Code B 18.2 and is specifically tailored for response personnel. A certificate will be issued to attest to the completion of the training. The MTSA/ISPS Familiarization module was developed to meet the professional training requirements outlined in 33CFR 105.215. This 4-hour seminar provides a basic understanding of the regulations, crime prevention and how facility personnel support security operations at the facility. The session is a pre-requisite for security personnel training. A certificate will be issued to all individuals completing this course. This 8 hour course was created to provide information on the requirements and process of auditing Facility Security Plans as required under MTSA regulations. This course supplements the Facility Security Officer course by providing in-depth training specifically on the auditing process. This 4-hour Security personnel training meets the professional training requirements for persons filling positions in seaport security outlined in current Coast Guard regulations.